Sponge burnout in bronze, patina. When snorkeling off the coast of Belize at the world's second largest barrier reef, I was amazed by the colorfully diverse and poetically symbiotic paradise of these underwater worlds. When I read that Earth’s coral reefs are projected to be completely gone by the year 2050 due to global warming and other human-related alterations to their ecosystems, I was deeply saddened. 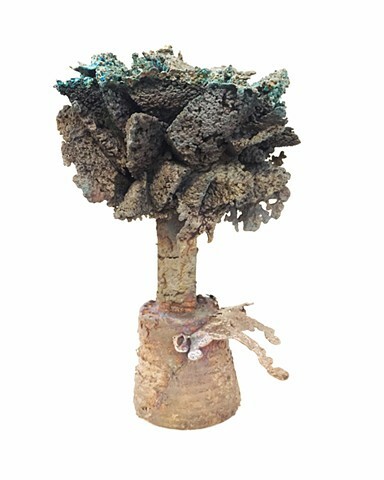 Memorializing the future loss of coral reefs, I cast these sponges in long-lasting bronze.